Toronto has many more outdoor compressor-cooled ice rinks than any other city in the world. That means we also spend much more to skate outdoors than other city in the world. According to Marcus Gee writing in the Globe, it costs us about $6 million a year to run those 52 outdoor rinks. 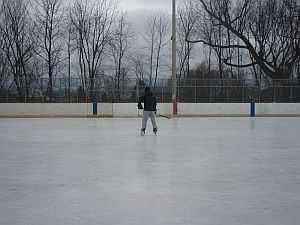 When Mr.Gee did his daytime round trip of the rinks in February, he found many of them empty or with only a few skaters. There are more skaters in the evenings, and some rinks are well-programmed and therefore consistently busy. But even those well-used rinks have far fewer skaters in March than during the earlier months of winter. Was there a yearly outcry when the rinks closed? The archive file doesn't show any. But over the last few decades it seems that Torontonians have lost their rink literacy -- they don't understand how compressor-cooled outdoor rinks work. The media and the elected representatives, even most skaters, make no fuss about delayed rink season openings or poor rink management, but when March arrives and there are some cold days, it's an easy moment for outrage. This year, once again, even with 17 outdoor rinks already scheduled to stay open, the "missing rinks" got their 15 minutes of fame. If the additional 11 rinks only get 2700 visits altogether (a generous estimate) during those extra two and a half weeks of being open, that means a cost of $100 per skate. According to the instant rink experts among the politicians and the media, we should be able to cover that cost through our taxes from now on. Well, why not? Toronto is rich, we don't have to be frugal, nor smart. If and when there's less money floating around, maybe we'll become smarter about the rinks. Go see for yourself how many people are skating at your newly re-opened neighbourhood outdoor rinks today. Two? Six? Canadian Tire and Scotiabank have covered themselves with glory by donating $270,000 to keep 11 additional rinks in ice until mid-March. The Globe's confused editorial this morning says that community groups should emulate Dufferin Rink by setting up public private partnerships with "local community groups." There is no such partnership at Dufferin Rink. 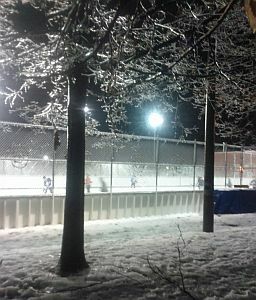 And this website, cityrinks.ca, has gathered years of evidence -- from outdoor rinks across the city -- that the long-running pre-amalgamation practice of running the rinks from mid-November until the end of February works the best. Not only does that practice recognize the folly of fighting the March sun with expensive compressors, it also takes account of skaters' inclinations. Winter is exciting in November, tedious in March. Even on the rare good-ice days in a normal March, the rinks have a small fraction of the attendance, while the compressors turn into energy hogs on days when the sun comes out to lick away at the ice. Councillor Paula Fletcher's idea of having some scheduling flexibility is nice. Maybe it can be tried. But back in December, when new-immigrant ESL school classes in her ward were locked out of the change rooms at Monarch Rink (policy: the change room stays locked on weekday mornings), the same councillor took no steps to change that. Today Monarch Rink has perfect, open, empty ice. The schools no longer come, because their phys ed schedule has moved on. Flexibility would certainly have been good, back in December. Toronto has far more outdoor compressor-cooled ice rinks than any city in the world. 34 have closed for the season -- that still leaves 17 open right across the city, plus Harbourfront makes 18. 18 open and free outdoor compressor-cooled rinks are still more than any other city in the world. Plus there are lots of natural ice rinks. Our cityrinks list is just the tip of the iceberg. Most of the 17 rinks still open were not showing a lot of skaters today, nor the rest of this week either. Did any reporters or politicians come skating, or even come to check out more than one rink for a 10 minute visit? The fact is that by this point, many skaters have lost their enthusiasm for winter. Even when the ice is good (which it won't be as soon as the temperature approaches zero on sunny days in March), the rinks get far less use than in the early, excited part of winter. But the "outrage" of closing outdoor rinks keeps on making good copy for the media. Nine years ago, the Toronto Sun ran a headline when the rinks closed at the end of February: "Pink Finks Sink Rinks." That's because City Council was supposedly leftist and stingy. Now we have an article in the Toronto Sun in which a mayoral candidate deplores any closures. The Toronto Star is a bit more balanced but not much. There are many ways the outdoor rinks could be made better (see the Feb.13 blog). Keeping all of them open into March -- when so few people come to skate -- is not one of those ways. Wheelchairs should not have to ask special permission. A rink enthusiast wrote: "the helmet issue is all about access. The rink must be easily accessible to the community. Must must must." Yes, access is the big issue. The city has posted rules. When the rules limit access, they should be changed. Wheelchairs are allowed on the rink "if the supervisor agrees." 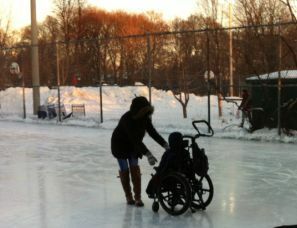 But wheelchairs should be allowed on the rinks no matter what. The wheels can be easily cleaned of salt, which is one of the worries posted on the city's rules page. Staff can help make the experience a good one. Disabled children wearing their own therapeutic head protection should not switch that for a hockey helmet. Strollers on the ice are an access issue for families. Strollers can be treated the same way as wheelchairs. Forbidding strollers to come on the ice is restricting access for people with young children -- not okay. 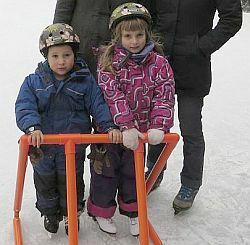 Staff can help wipe down the stroller wheels, and get on the ice along with the parents if help is needed. Infants should not be required to wear hockey helmets if strapped into a stroller -- a helmet can hurt an infant's neck and head. The stroller is the baby's protective frame. Monarch Rink refused to allow morning access to ESL school classes. Change rooms: Some of the city's rinks keep the change rooms and washrooms closed all morning or (in the case of the smaller "tennis-court" rinks) all day every day. That means schools and families have a hard time (and everybody else too). Who wants to sit in the cold snow to change their skates, or to look for a tree to hide behind when washrooms are locked up? 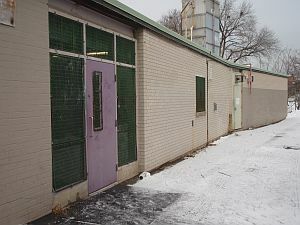 This situation has been improving gradually, with Etobicoke in the forefront -- unlocking change rooms for warmth and washroom access, even when there are no staff on site. 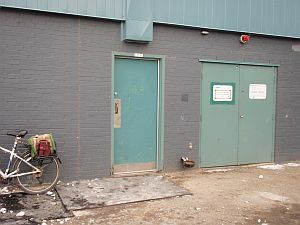 Doors: Some rinks in Etobicoke got in the habit of keeping their front doors locked, without even a sign directing people to the back doors. People "in the know" would go to the back door, but newcomers would be confused or just go home. At West Mall Rink (the main rink in Etobicoke!) the front doors are right by the bus stop, but they are usually locked. People have to walk a long way around to the back doors, near the car parking lot. 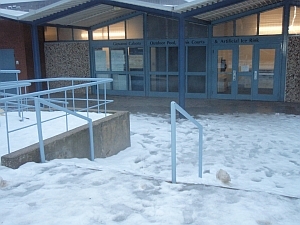 At Giovanni Caboto Rink, the front steps were kept unshovelled and front doors were kept locked, for years. This has now been fixed, so people can come inside from the front. Many of the rink houses are cheerless and windowless, even scary. The message seems to be "hurry up and skate, then leave." Even change rooms that have windows and visibility toward the rinks are often depressing. Rink houses could, and should, be wintertime social spaces for their neighbourhoods. Regent Park South Changeroom, nothing to do. Some rink houses have been converted into social spaces. None of it costs very much. Sociable sitting areas provide access to neighbourhood people of all ages -- families meeting one another at the rink, youth hanging out, seniors who want to play cards -- whoever wants to be in a social space that includes skating but also more. 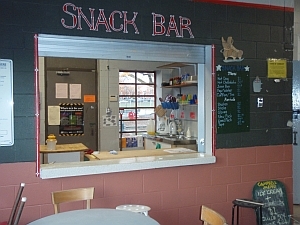 A kitchen for snacks improve access for parents and caregivers and hungry shinny players, who don't have to interrupt their skating for longer than it takes to quickly refuel. Skate rentals provide access to newcomers who don't have their own skates, and also to families with growing children who can't afford to buy new skates every year. (1) the parents of small children are forced to buy hockey helmets in addition to helmets they may already have (like bike helmets). Parents who don't comply are ordered off the rinks. (2) shinny hockey players who choose not to wear body armour for pond hockey (non-contact) are ordered off some of the outdoor rinks. At those rinks, drop-in attendance has shrunk. Access is limited mainly to hockey leagues, with here and there a few hours of drop-in pleasure-skating. At many rinks, the refusal of shinny hockey players to wear body armour (including helmets) has carried the day despite the official rules. So their access to the rinks has been maintained, although unacknowledged by managers at City Hall. General manager Jim Hart's response to our helmet questions: sounds a bit like go away!. Hopefully he doesn't really feel that way. Here's our first response. Read more about the helmet issue. Overnight and much of the day until late afternoon it snowed, amounting to about 15 cm. At 10.30 a.m. the city's outdoor rinks web page listed all the outdoor compressor-cooled rinks that are running this season (51) as CLOSED. Then at 12.30 the city's website listed all 21 downtown ("South District") outdoor rinks as "operational -- programs cancelled until further notice." Etobicoke, North York, and Scarborough rinks were all still listed as "closed." Hard to know what an operational rinks with no programs looks like. The "further notice" came at 7 pm, with the website suddenly listing almost all the south district rinks as simply "operational." An example: Regent South was declared "operational," but at 8 pm there was more than a foot of snow on it. In reality, the downtown west rinks began to be cleared from about 3 pm on, and many of them were skateable by later afternoon. Not so for the same number of downtown east rinks. Basically the web page is unreliable as soon as there's a weather change involving snow or ice. Some rinks marked as closed will actually be open many hours sooner than the web site says; other rinks will be closed when they're marked as open. This problem could be solved immediately if rinks were allowed to have their own listed phones again, like swimming pools do. But so far, management has not budged on this -- like a stubborn kid. 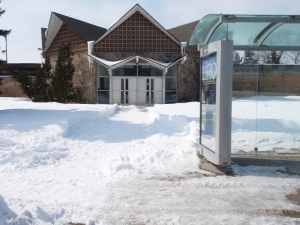 Summerlea Rink, in Councillor Doug Ford's ward in Etobicoke, was closed from Dec.22, 2013, when the ice storm cause the area to be without power, until January 16 2014, a very long time after the power was restored. The rink was simply locked, no signs explaining why, or when it might be open again. According to the Councillor's assistant, during that whole three weeks, not ONE person called to complain or even to ask what was wrong with the rink. Does anyone care about this rink, does it have any allies, or is it a kind of orphan? On January 18, the Globe published a piece about the outdoor rinks by by Marcus Gee, about his morning travels to various rinks across Toronto. Many of the rinks were empty or had only one or two people skating. Some of the change rooms were locked. Some of the rinks were snow-covered or had trash blowing around them. But according to the Globe piece, it costs $6 million a year to operate these outdoor rinks. Are we getting value for money? Helmets have lost some of their luster in both the medical and the sports media. It turns out that they are of limited (or no) use in preventing concussions -- which is really their main purpose, as far as many skaters are concerned. The City of Toronto has hung on to its 9-year-old mandatory helmet policy, requiring all shinny hockey player to put on head armour. But noncompliance by shinny hockey players continues to rise citywide. The city’s inability to enforce its own policy should be a flag to rinks management. It's time to revisit the helmet rules, but with a different procedure than the last time. Instead of a staff decision made at a closed meeting at City Hall, the city should welcome wide-ranging rink-user input. CELOS, the Centre for Local Research into Public Space (the sponsor of this website) has put out a "Special Helmets Issue" to collect the facts. 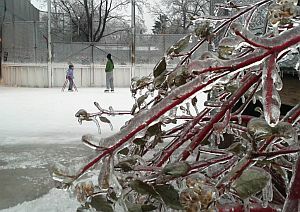 Dufferin Grove Park was coated with ice, as was every other place in the city: ice storm. In the morning the rink limped along with very few skaters and no road salt left to salt the walkways. By later afternoon people had kind of gotten desperate, or readjusted their "normal," because the rink house filled up and there were quite a few skate rentals. Many parts of the city were without heat or light, but this luckier neighbourhood never lost power. The good news: there continues to be really good ice maintenance. The weather is helping -- quite cold and minimal snow. So it's too early for complacence. But the fact is, all over the city the ice is cleaned early in the day, the gates are left open for skaters, it works. The not-so-good news: too many change rooms continue to have restricted access. 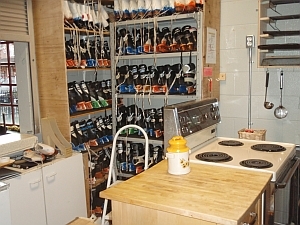 Most of the east-end rinks still keep their change rooms locked in the mornings. Staff say it won't change. The results are predictable, as soon as it gets cold -- rinks, in perfect condition, have few or no skaters, and no school classes. 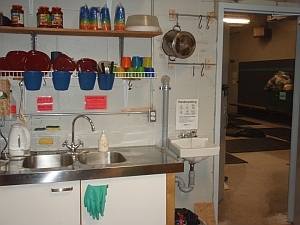 The better news: a change room unlocked for students. On Thursday morning when a big class of ESL students came to Monarch Rink with their teachers to skate, they found to their happy surprise that they wouldn't have to sit on the cold ground to change into their skaters -- the rink building was open. It turns out that the zamboni driver, when he heard that the students were coming, left the building unlocked for them. Just exactly what staff do in Etobicoke -- smart. The good news: good ice maintenance citywide. After the recent snowfall, the rinks were cleaned up really fast, apparently all over the city. And this year, there seem to be very few rinks that have a one-rink-only zamboni operator just sitting there in his or her office in between ice maintenance sessions. The drivers help out at multiple rinks. CELOS asked for this change over ten years ago, and finally gave up asking. Yet, here it is, a good economy and a good use of staff! The not-so-good news: locked changerooms/ washrooms. Some of the rinks in the Toronto/East York region continue to keep their change rooms/washrooms locked all weekday mornings (in some places, on weekend mornings as well). This means that school classes have to change outside in the cold, and so do shift workers and all other morning skaters. Students coming with their school classes are most affected. We've heard that Parks and Recreation and the school boards are in the grip of a standoff -- since schools charge Parks and Recreation to use school facilities for after-school programs, school classes are supposed to pay for permits for the outdoor rinks too. The consequence of the standoff, if that's what this is, is empty rinks much of the morning. But the fuel to cool the rinks keeps being used anyway. A false economy! As well, the policy of locking the changerooms/washrooms all morning is utterly inconsistent across the city. At Dieppe Rink -- a newly rebuilt double rink -- the change room/washrooms are locked and unavailable not only on weekday mornings but even on Sunday mornings, when there are lots of skaters on the rink. Monarch Rink makes the ESL students from nearby schools stand around in the cold without washrooms when they come to skate (see the Dec.7 entry on the Rink Users' blog). And yet in Etobicoke, all the rink changerooms are open from 9 a.m., even those with only intermittent staffing. Smart! The city should apply this principle consistently everywhere else. The excuse of "security issues" or "kids will come in and smoke pot" should not be used to deprive everyone else of the warmth of the change rooms and the use of the washrooms. Happily,that same excuse has not yet been applied to keep unstaffed (i.e. all) park washrooms locked in the summertime. Yesterday, Dec.5, was a nice warm day -- temperatures went up to 12 in the mid-day, with periods of weak December sunshine. By 6 pm, all but one of the North Toronto outdoor rinks were listed as closed. Four Etobicoke rinks were shut down too, plus one closer to downtown (Cedarvale). 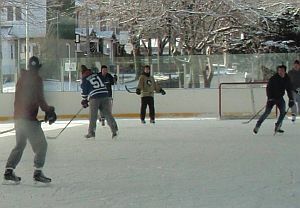 Closing rinks when there is even a thin layer of water on top of the ice is a common practice in North Toronto. Beyond that, rinks with thinner ice are more unstable and vulnerable to warm temperatures early in the season. Since the ice-making at most of Toronto's municipal outdoor was so short before opening day (at many rinks, flooding began two and a half days before opening), there wasn't much in reserve. During the same time as all these rinks were closed, Harbourfront's Natrel Rink (not municipal), which had careful ice-making from the beginning, was filled with skaters. Dufferin Rink -- one of the few rinks that had a good standard of ice making at the outset -- was busy too, with excellent ice. How long will this low standard carry on? The good news: (1) the rain today helped add some thickness to the thin ice at so many city rinks, the day after opening day. (2) Here and there, a newly-opened rink was in good shape, with smooth ice of adequate thickness. The blue ribbon goes to Harry Gairey Rink at Bathurst and Dundas (the rink has two other names as well: Alexandra and Scadding). When we visited shortly before 10 a.m., the rink change rooms were locked but the ice was open and the first skaters looked like they were having a really good time. And the bulletin board which used to have four-year-old rink schedules on it, had been cleared of everything except a brass plaque telling the who Harry Gairey was -- a good story. The less-good news:' The city's outdoor rink web page says they update it twice a day, but for opening weekend, the updates were only once a day, and even then they were questionable. I called 311 to find out if they had any newer information. They didn't, but the operator told me that rain "doesn't treat outdoor rinks well," so they might not be in good shape. I told her that actually the rain was helping to build the ice up, and she listened politely if doubtingly. 311 is a very odd concept, a favourite project of former Mayor David Miller. All of the city's public information was rerouted centrally. For instance, outdoor rinks used to publish their individual phone numbers so that people could just call up the rink they were interested in, and find out if it was in good shape. Now all the rink phone numbers are unlisted. All information is supposed to flow through 311. Those folks are supposed to have the answer for everything, or at least, to know who to ask. But they can't keep all those disparate little facts under control. You are on the right path regarding finding the city outdoor rinks information. 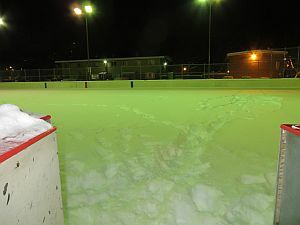 However, keep in mind that the city outdoor rinks are operational only if weather permitted. Unless the temperature dipped below zero, the ice is going to melt and become slushy. Thus, not safe for public skating. Oh dear. My 311 respondent had maybe never heard of how else ice could be made. And neither, sadly, have at least some of her colleagues whose job is to answer all the rink questions of skaters, among thousands of other topics. This is the week when ice was being made on most of the remaining 38 of the city's outdoor rinks. Once again the Etobicoke rinks (and some rinks in other areas) did not even start their ice-making until Wednesday evening, two and a half days before the opening date. Some of the downtown rinks started earlier but then missed a day in the middle. Rain early in the week froze to the cooling slabs, and that helped a bit, so today, the scheduled opening day, most rinks were able to get on the city website's "operational" list. Thin ice, patches of cement, pylons set out -- that's a very low standard of operating. How long can it go on? It looks like a strange wind is blowing in Etobicoke -- all the earlier-opening rinks started their ice-making too late and all of them are in trouble on opening day. So far, no apologies, though, only excuses -- "the weather was too warm"! 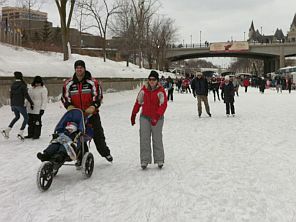 At West Mall, the decision was taken to shut down the pleasure-skating side to conserve energy for making ice on the hockey side. It's not fossil fuel energy that's lacking, though, it's human energy. And accountability -- for the rink manager to say: "we made a mistake and we're going to fix it. Tonight, there will be a twelve hour overnight shift of two park staff patiently flooding at each rink that's a mess -- and not only flooding three times during the shift with naps in between. If it's still not fixed, we'll do another one tomorrow." Year after year the same thing is evident -- the lack of will to make the rinks work properly. Meantime. there seems to be citywide enthusiasm by skaters to make "natural" rinks from scratch, just to get out from under the city's complicated, rule-bound approach. Next fall, it's time to try an experiment. We'll call it Plan A: in November 2014 give the task of the Etobicoke ice start-up (hosing) to rink enthusiasts. Let skaters do the start-up floods, and cut their permit fees in exchange. If the rinks get opened on time, with good ice, it's a keeper. The union will threaten mayhem -- well, let them arrange for an apprenticeship at Harbourfront and then pattern the ice start-ups on good practice. If they're unwilling, back to Plan A. At 2.30 on Wednesday afternoon I stopped by Rennie Rink, and found to my amazement that they had not begun to make ice. Three days before the scheduled opening, and bare cement on both rink slabs! Two of us came back in the evening, at 8.30. The rink was plentifully flooded, areas of water with islands of ice. The two city staff said, "we put more than a thousand gallons of water on there since the start of our shift!" Well, yes, we could see that. But to lay down good ice at the beginning, only a small amount of water should be put on each layer, creating a laminate of thin sheets of ice that will be a stable base throughout the season. These folks may not have known that. They didn't appear to know how compressors work, either, since they assured us that they could not have begun to make ice any sooner, since it had been sunny on Monday and Tuesday, and still a few degrees above freezing. We said, but what about Harbourfront? -- "They must have much stronger compressors." [They don't.] What about Greenwood, don't they have their ice in? -- "Their rink is covered." [Only half, and the skating trail under the open sky has just as much ice on it.] What about Dufferin Grove? -- their ice is in. "No, it can't be. We know what we're doing. The weather still has to cool down some more." We asked if they would try to catch up by doing some overnight floods. No, their shift was over at 11 pm, that was the end for the day. The formula for starting up outdoor ice, when a rink is cooled by compressors that push brine through the pipes, is simple: thin layers of water frequently applied during darkness (more than 12 hours a day at this time of year). The second part of the formula is doing whatever it takes to get the job done at the right time. That means counting backwards from opening day, adjusting to the weather, and giving yourself some leeway so that you don't depend on luck (cold and rain, maybe) for success. None of those things seem within the secure grasp of the Parks Department. Toronto has more outdoor compressor-cooled rinks than any city in the world – 53. But our civic knowledge of the physics of ice maintenance hasn’t kept pace with our collective rink wealth. Many people seem to find it amazing, even shocking, that outdoor rinks can be skateable when the air temperature is above freezing, as high as 11 or even 15. What’s the surprise? Collectively, as taxpayers, we spend about $500 a day at each rink to fuel the compressors that cool the rink pad. The rink compressors vary between 100 and 200 horsepower each – you can hear their noise through the compressor-room doors at the sides of the buildings. These compressors push a brine (salt water) solution through a big tank of cooling ammonia, and then out into the extensive grid of PVC pipes underneath the concrete floor of the rink. The cold liquid brings the entire big concrete slab to well below freezing, so any water that’s put on the surface of the rink pads sets up as ice right away. The brine liquid in the pipe grid circulates back into a large pipe in the “header trench” right next to the building, underneath where everybody stands when the zamboni is doing ice maintenance. From there the brine gets pushed back into the compressor room, where it passes through the freezing-cold ammonia tank, and out again into the pipes under the concrete, and so on. The only serious match for this powerful cooling system is the sun, and in the months on either side of the December 21 winter solstice, the sun is very weak. It doesn’t get to spend very much time above the horizon, and that suits the compressors just fine. The sun begins to gain real power toward the end of February, which is why, on a sunny day on, let’s say, February 25, when the air temperature is minus 8, the ice gets really mushy near the reflective boards, and even a bit soft in the middle. The compressors are losing ground as the sun prepares to bring on spring and summer. But on a low-sun Monday in November even at 11 degrees, a thin film of water forms on top of solid ice, and the shinny hockey and pleasure-skating are brilliant. It’s not only rink users whose rink literacy is in some need of upgrading. The city’s rink staff are also confused. In our travels around the city's outdoor rinks, we have often heard zamboni drivers say that they can’t make ice because the temperature is above zero. The city’s Park management blames a multitude of ice-making sins on the temperature, global warming, etc. Convenient – but most of the time, not true. The compressor-cooled rinks can do their job, and having all those rinks can take some of the sting out of the dark months of winter for Torontontians. The science is there, the history is there (pre-amalgamation), professionals say it can be done, Harbourfront is doing it, even volunteers have done it. Yet Toronto rink staff are a little rocky on the fundamentals of ice making.